Well Done USCG! Our thanks to Officer Justin Heck for these updates and charts. See Partially Submerged Vessel for the original Local Notice/NAV ALERT. If you get a photo of the salvage equipment, please send it to us! The Marine Contractor successfully removed the underwater obstruction, and the dive survey team confirmed no other debris was on bottom in the immediate area of the wreckage (33-22.05N 079-15.158W). 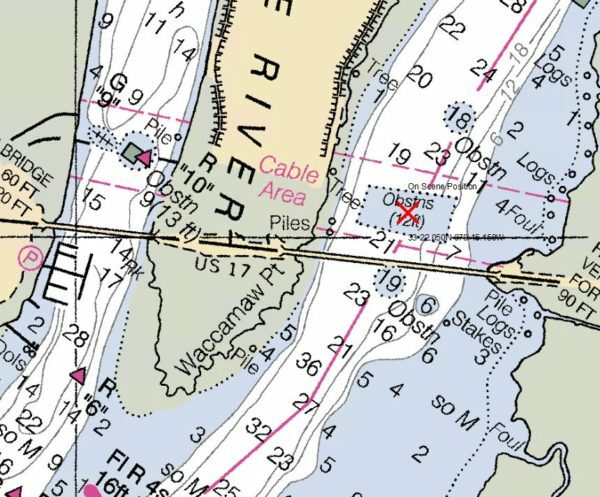 Mariners are reminded to report Aids to Navigation discrepancies (missing, damaged, extinguished or off-station), shoaling or hazard to navigation and bridge discrepancies (including lighting) to the nearest Coast Guard Sector. 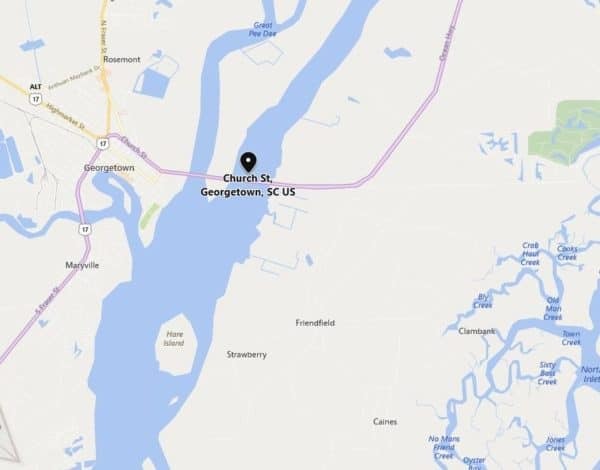 For South Carolina and Georgia waters, coastal and tributaries contact COAST GUARD SECTOR CHARLESTON (843) 740-7050. For North Carolina waters, coastal and tributaries contact COAST GUARD SECTOR NORTH CAROLINA at (910) 343-3882. Salvage equipment is currently mobilized on location. Removal of the vessel is expected by night fall on Saturday, April 13, 2019. Mariners are reminded to use caution while transiting the area. Mobilization of salvage equipment is currently taking place and removal is expected by Sunday, April 14, 2019. Mariners are reminded to use caution while transiting the area. Please find attached images which are related to the vessels current position, 33-22.05N 079-15.158W (33°22.0500N / 079°15.1580W, 33.367500 / -79.252633) . As of this morning [4/15/19] a tow boat and crane barge were on site raising the vessel.